Intacs prescription inserts provide an effective option to improve a patient’s vision prior to considering a cornea transplant. Intacs are clear, thin prescription inserts placed in the periphery of the cornea to reshape the curvature of the cornea from within, enhancing the natural shape of the eye to correct mild nearsightedness. Although Intacs were originally designed and FDA approved to safely correct mild nearsightedness, through the collaboration between physicians and Addition Technology, Intacs have emerged as a new therapy for patients with keratoconus. Keratoconus is a disease that creates a thinning of the cornea or the clear front surface of the eye. Normal outward pressure within the eye causes the cornea to progressively bulge into a cone-like shape. The change in the cornea’s shape can have a dramatic impact on one's vision. In more severe cases, normal everyday activities such as driving and reading can be difficult to perform. Although keratoconus rarely results in total blindness, 20% of all patients will at some time undergo a corneal transplant, according to medical experts. Nobody knows the cause of keratoconus for certain, although there is evidence that the disease has genetic origins and is possibly triggered and worsened by environmental factors. It normally affects both eyes, although at differing points of onset and rates of progression. In most people keratoconus begins during their teen years and progresses at varying rates until stabilizing in their 30s or 40s. Keratoconus is estimated to affect one in 2,000 people across all races. It is normally treated with rigid contact lenses that reshape and flatten the pronounced bulge in the cornea while improving one’s vision. 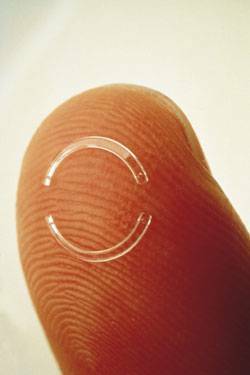 A proper contact lens fit is crucial to insure optimal vision, comfort, and eye health. Poorly prescribed or outdated contact lenses can lead to additional complications like corneal abrasions, scarring, and infection. The procedure itself will take approximately 15 to 20 minutes but plan to be at the center for about two hours. Prior to any surgical procedure, it is common to experience a degree of anticipation and anxiety. It may be comforting to know that the Intacs procedure is far less invasive than a corneal transplant or many other surgical procedures of the eye, and the Intacs success rate is high. The surgeons performing the procedure are typically corneal surgeons, having expertise with keratoconus. Each surgeon has also undergone a rigorous training process specific to Intacs. Follow-up visits will be required to monitor the healing process and to evaluate the visual benefits of the procedure. Even after a successful procedure, glasses or contacts may be required.